Oh my goodness, I had so much fun with these gorgeous Petaloo flowers! They are so detailed and go perfectly with Quick Quotes Cherry Truffle collection. I used bubble wrap and some acrylic paint to create the circular paint splash to the right of the photo. The layout was inspired by a sketch from sketch inspirations. When I was in Washington in September for a Private Reserve, I was lucky enough to get to see, touch, feel and take home with me some of the new paper lines that are being released very soon. When I received my Petaloo flowers I knew right away that I was going to pair them with our new Dreamscape Paper Line. I used a 6x6 Stretch canvas, covered it with Dreamscape paper that I inked with a Verry Berry Powderpuff Ink Pad, I used the Grand Calibur to cut a frame which I glued the Teresa Collins chipboard saying (From the October Club Q) to. I surrounded the chipboard pieces with the beautiful Petaloo Flowers (includes Lavender Sweet Pea Flowers, Mini Lavender Roses, Lemon Canterbury Roses and Vanilla Canterbury Roses). I am going to hang this canvas in my scraproom so that I will always be reminded to be Thankful for all things. I am just loving all the layers, flowers, & techniques shown by each designer. This is a great way to learn. Love the projects for today. The Love U lo is so adorable, love the bubble wrap painting, and the colors used on Thankful are so soft and pretty. Beautiful projects. I love all the products that were used to create them. Ooh, what gorgeous products! QQ and Petaloo are definitely a perfect match! These are beautiful! I totally love the bubble wrap idea, how clever! What lovely projects!!!! I am just loving all the flowers!!! Julie, your layout is gorgeous! If the little girls in your photo are your daughters, they are beautiful! Love your bubble wrap technique and will file that technique away in my mind for future use. Michelle, your card is equally beautiful! 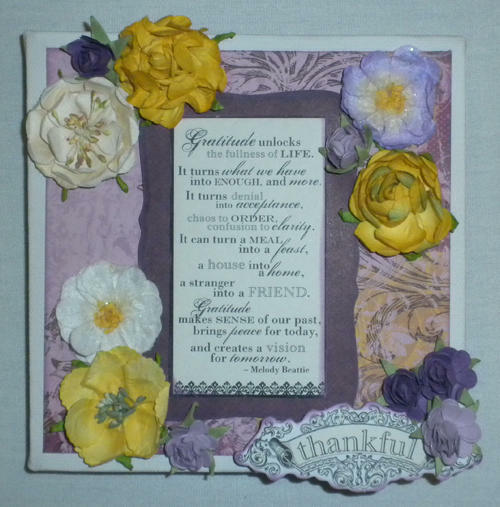 The quote you used is wonderful and you made great use of the beautiful Petaloo blossoms. I love the purple/gold color combo. I'm enjoying seeing the fantastic design team projects for both QQ and Petaloo this week and will hate for them to end. I hope the two companies will team up again some time in the future. Thanks again for all the inspiration. Darn! I'm so sorry, ladies but I forgot to include my full name on my comment, #10 above. My name is Anne Brown. Beautiful projects! The bubble wrap is a great idea/technique! Beautiful projects! I really like the bubble wrap idea. 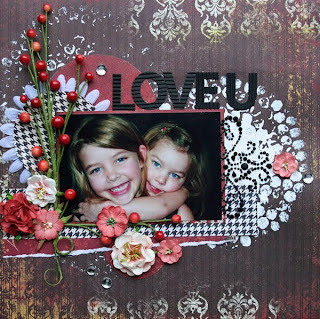 Beautiful layouts, the 1st is gorgeous with its texture, layering, and colors. The 2nd is so sweet with its flowers and colors. Thank you fo rsharing them, and a chance to win. Luv the layouts! !i've been card making for a couple yrs., starting in Jan. with scrap booking..so excited!!thx. for sharing & chance to win..
Love these projects! New to the blog, going over to petaloo to check it out! Julie and Michelle...thank you both for your beautiful projects. Julie I love your layout and the way you combined your papers with the flowers. Michelle, I love how your flowers accent your sentiment in the middle. Beautiful color combination as well!